KENNY SHIELS says his Derry City side will give league champions Dundalk the respect they deserve but reckons Stephen Kenny’s men have had a huge advantage in terms of preparing for tonight’s match at Oriel Park. The Co. Derry man says Dundalk are at least three years ahead of the current ‘Candy Stripes’ squad in terms of the stability of the team and says Kenny’s troops hold the upper hand given they’ve had three more days to prepare for tonight’s match. “They’re three years ahead of us in terms of the building process at least and we have to respect that and give the boys some support in that context,” said Shiels. “And they’ve had three more days to prepare for the game than we’ve had. 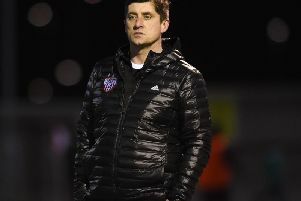 Tonight’s trip to Oriel Park is Derry’s fourth away game in their opening six matches and Shiels believes his side have done superbly well to be in their lofty position after a difficult run of games. “People are forgetting that this is our sixth game and already our fourth away from home. To have played a quarter of your away games in the first 27 days is a fantastic statistic. So, hopefully, the fixtures become a bit fairer to us. “But the calendar has really gone against us despite doing quite well. We’ve got three games coming up in six days which is crazy. I don’t know how we’re going to fit those in but we’re going to have to, according to the FAI. That series of games begins with the visit of Shamrock Rovers to Brandywell next Friday night and Shiels is hoping his side can go into that match off the back of a five match unbeaten run. The Derry boss is expecting a tough game against Dundalk tonight but he claims a victory, which would take them three points clear at the top, is not beyond his players. “There’s nothing that’s beyond us in any way, in any shape or form,” he said. “We have to have a belief that we can achieve. Dundalk are top of the league and we respect that but we’ll go with all guns blazing and see where it takes us. “I’m expecting a tough game,” he continued. “The amazing statistic is, if we win on Friday night, and who would have thought it after the first game, we’d be six points ahead of Cork, albeit they would have two games in hand. That would be quite something, considering we would have played Dundalk and Cork. We’ve got Rovers next week so we’re getting all the big guns in quite early. “We prepare for every game with 100 per cent knowledge, organisation and understanding. You need all of those within your programme. We’ve been looking at how they play and identifying where we can damage them. “It’s a big ask to go there and win but we’ll give it what for anyway. “I don’t think we deserve credit for our results and performances so far. I think we deserve support and the support has been great.